The online game, Lucky 88 is a creation of Aristocrat Technologies, the most popular online gambling games manufacturer in Australia. The slot is an attempt to explore the beauty of the Chinese belief in numbers. One of which is the number 8, which symbolizes Good Luck in China. In other words, Lucky 88 simply refers to “double luck”. Another thing about this slot is that it comes with no download policy. The Aristocrat Technologies did well by including exciting features. 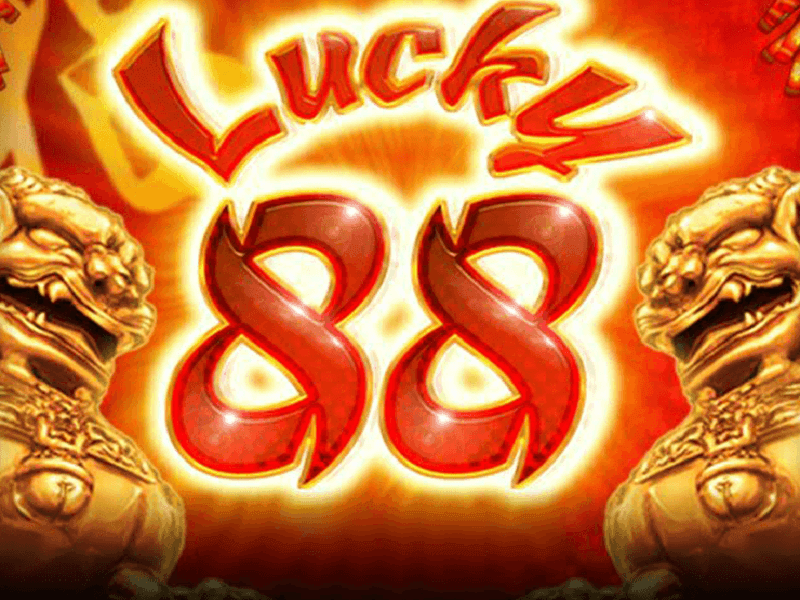 Lucky 88 slot has several symbols which portray the Chinese culture to the world. These include the Chinese Lamps, high valued cards such as A, K, Q, J, 10 and 9. Apart from this, there are some traditional significant Chinese symbols that are included like the golden lions, Chinese drums and lamps, and pagoda. It is a slot where people from all over the world could play for free or real money. You can play free Lucky 88 casino slot machine, when you do this, you are just playing for the fun of it, and no reward is attached. To play Lucky 88 online for real money, you would have to deposit into the casino machine using your MasterCard or PayPal account. You just have to place your bet to start winning. The Lucky 88 slots machine is now one of the best and most popular in the USA, Australia, and the UK. However, only the USA and Australia have access to its online version. The game has 5 x 3 reels, 25 paylines and you can bet on whichever level you wish to. You also have an option of paying extra 5 coins to buy more chances when using the bonus round. It is good to note here that this game can either be played for fun or real money, in other words, it has a multiplayer mode where people from different parts of the world place bets with real money. Here, winning entitles you to take all the bets placed. The least bet you can place is $0.01, while the highest is $4. The slot machine only gives room for one coin for each line, which means the highest it can take to be $120. A more exciting feature in this mode is the jackpot which awards a maximum of 888 coins which equals $3,552. You will see some signs whenever you enter into the bonus round. You will trigger the free spin bonus when you land three red lantern symbols.. The red lantern is also known as the scatter symbol. One interesting about this game is that the free spins can be retriggered. Here, instead of using the free spin, you may opt to roll a dice. You are allowed to roll the dice three times. If you roll an “8,” the “8” will hold still, and you will be allowed to spin again and again until you do not roll an “8”. The good news is, the re-spins will not count as a roll, and until you fail to roll “8” three times, you can keep spinning. When you are playing for real money, your cashback will be determined by the amount of “8” showing on the data table. This slot is a game which everyone would love to play. The fact that it has several free spins is a reason why the RTP is between 89.91 to 95.46%. In addition to this, it’s payout makes it one of the most lucrative pokies out there. You too could have a feel of this pokie by playing it. 0 responses to "Lucky 88 Slot"